One of the biggest criticisms that continue to come out of the Marvel Cinematic Universe films is the lack of strong, memorable, and recurring villains. Outside of Loki (Tom Hiddleston) and Thanos (Josh Brolin), no other villain has ever made multiple appearances in the MCU. That could be changing as the universe moves forward with characters such as Baron Zemo and Baron Mordo (if they stick to his comic heritage) making more than one appearance. While many of the villains have died by the end of their respective appearances, the future of Red Skull (Hugo Weaving) was left very much in the air at the end of Captain America: The First Avenger. Even though many viewers liked what Weaving was able to do with Cap's biggest foe, the actor himself has repeatedly voiced his unhappiness with the role. Most people have taken this outspoken dissatisfaction with the role to mean that we have seen the last of Red Skull, especially after Weaving stated he "would not want to do it again." At the very least, this could have been the last of Weaving playing the character. 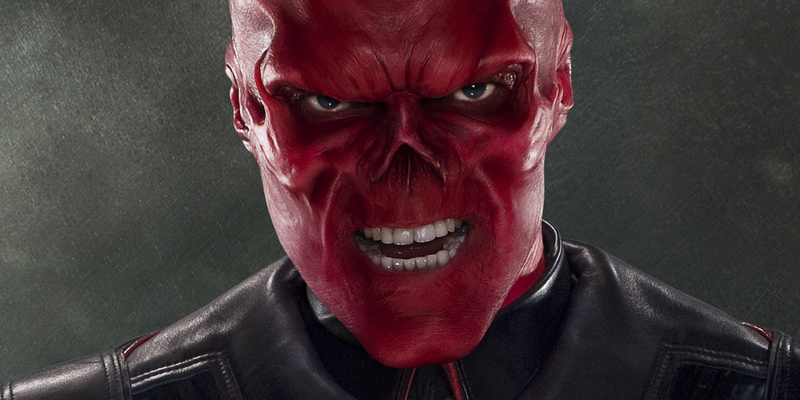 However, in a surprising change of events, the actor has recently expressed the fun he had as Red Skull. Yahoo recently did a profile on Weaving in which they asked him about every film he has ever been a part of, and when Captain America: The First Avenger came around, he had (mainly) good things to say. Weaving enjoyed the role itself and the experimentation it allowed him to do as an actor, but is still not entirely happy with the practicality of the mask. With this flip in perspective, he could be more open to a return in the future, but he has no idea if that is in the cards or not. It was fun to play; I enjoyed the outrageousness of the German accent that I employed and I enjoyed the extraordinary mask and costume, even though it was unbelievably hot inside it. I enjoy mask work; I enjoy trying to animate masks and reveal certain things that the mask itself might not reveal. V for Vendetta was another example of that, but there was less animation within that mask versus the Red Skull. With Marvel, it’s pretty basic stuff: accept the deal and enjoy the ride. It’s not a major stretch for an actor, but on the other hand the difficulty with the Marvel universe is maintaining a link to a human dimension within such an extraordinary, technological CGI universe. In terms of me going back and doing another one, I don’t know. I’m not sure what they’re up to with the Red Skull. There is no real reason why Weaving would suddenly have this change of heart, unless after further reflection he realized the once in a lifetime opportunity he was given. That is impossible to say for certain, but what could more likely be the case is Marvel offering him a chance to return for Avengers: Infinity War or the follow-up. The whereabouts of Red Skull is currently one of the biggest questions remaining in the MCU after being swallowed up by the Cosmic Cube. A return in an upcoming film could very much be in the cards, and could be the result of Weaving's change in attitude. If this is the case, nothing official on his return will come out until Marvel is good and ready to make that announcement - even if another report beats them to it. There is hardly any other explanation why Weaving would suddenly switch gears and say he actually "enjoyed" the film, costume, and process. Even if he did come to terms with the film, his desire to not return has also been eased to a more accepting tone. After all, he is under contract for more films so Marvel could force his hand if need be, but it is unlikely they would force an actor to come back if they did not want to. Marvel has possibly already done this before by figuring out ways to keep Jane Foster out of the universe after Natalie Portman's desire to return also dwindled. If Weaving still was against a return, Marvel could more than easily recast the role, especially with a mask being worn overtop the new actor. What very well could have happened is Marvel pitching their idea for Red Skull's role in an upcoming film to Weaving, he liked what he heard, was asked to return but told if he did not want to, they would simply find a different solution. Weaving cares more about his character's journey than what he must look like for a role, so the door could now be open to his return in the near future. Doctor Strange opens November 4, 2016; Guardians of the Galaxy Vol. 2 – May 5, 2017; Spider-Man: Homecoming– July 7, 2017; Thor: Ragnarok – November 3, 2017; Black Panther – February 16, 2018; Avengers: Infinity War – May 4, 2018; Ant-Man and the Wasp – July 6, 2018; Captain Marvel– March 8, 2019; Untitled Avengers – May 3, 2019; and as-yet untitled Marvel movies on July 12, 2019, and on May 1, July 10, and November 6 in 2020.